On Thursday, DISH Network took its Apple iPhone app to the iPad, allowing users to program and directly control their DISH DVRs. The free app, available form the Apple iTunes App Store, already has been released in a version for the iPod touch and iPhone. In that form, the app can be used as a means to program the DVR, browse a schedule of shows, and add and delete programs. The app is compatible with most DISH receivers. The iPad version adds a new twist, remote control, allowing a user to control the DVR via the iPad. ENGLEWOOD, Colo., Aug 05, 2010 /PRNewswire via COMTEX News Network/ -- DISH Network L.L.C., the fastest-growing pay-TV provider in America, today announced a free app for the Apple iPad: DISH Remote Access. 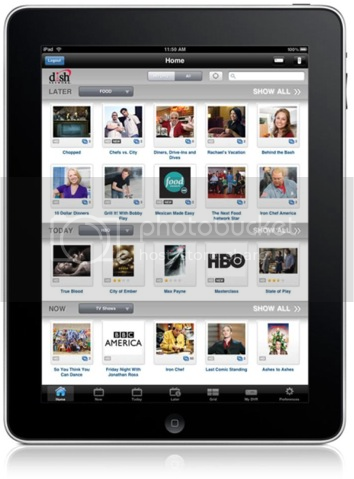 DISH Remote Access is the first and only app from a TV service provider specifically designed for the iPad that allows users to control their televisions and manage their programming remotely. Similar to the version available for the iPhone and iPod touch, DISH Remote Access for the iPad is a fully-featured remote DVR scheduler that provides DISH Network customers with complete access to all DVR functions and features. Users can schedule DVR recordings on multiple receivers, delete timers, browse and search nine days of shows, and manage their DVR libraries by setting recording priorities, resolving recording conflicts and deleting programs they have already watched. The DISH Remote Access app is compatible with most DISH Network SD and HD DVR receivers including the ViP 922, the world's only DVR with built-in Sling technology. "At DISH Network, we are excited about the potential of tablet computers - like the Apple iPad - to enhance the TV viewing experience and enable consumers to remain connected to their TVs everywhere," said Vivek Khemka, vice president of Customer Technology for DISH Network. The iPad-optimized DISH Remote Access app also includes a unique feature that transforms an iPad into a remote control for televisions connected to compatible DISH Network receivers. Using the iPad as a remote control, customers can change channels, browse the program guide, start playing recorded programs and enjoy all standard remote navigation features such as fast forward, rewind and pause. The DISH Remote Access app can be downloaded for free from the iTunes Store. Customers can also enjoy all DISH Remote Access benefits through the web browser on their laptops, PCs and smartphones. For more information about DISH Remote Access, visit www.dishnetwork.com/tveverywhere/remoteaccess. DISH Network L.L.C., a subsidiary of DISH Network Corporation (Nasdaq: DISH), provides more than 14.3 million satellite TV customers, as of March 31, 2010, with the highest quality programming and technology at the best value, including HD Free for Life. Subscribers enjoy the largest high definition line-up with more than 200 national HD channels, the most international channels, and award-winning HD and DVR technology including the ViP 922, the world's only DVR with built-in Sling functionality. DISH Network is first in Customer Satisfaction among all cable and satellite providers according to the 2010 American Customer Satisfaction Index (ACSI) survey results for the U.S. largest cable and satellite TV providers. DISH Network Corporation is included in the Nasdaq-100 Index (NDX) and is a Fortune 200 company. Visit www.dish.com , follow on Twitter, @dishnetwork (www.twitter.com/dishnetwork), or become a Fan on Facebook, www.facebook.com/dishnetwork. Dish remote access is definitely a benefit for all TV lovers like me! The 922 receiver is pretty awesome too. I work with DISH Network and what makes me really happy is the new sling adapter that came out, that gives phones access to TV everywhere! All it takes is a purchase of the adapter ($99, and extremely small piece of equip) a free download from either android or iphone markets, and your good to go. Literally watch live TV or any recorded programs your already have right with your phone. You can do it anywhere! It's amazing!